Things French, life in France, general wittering and the odd rant. Today I'm recovering from yesterday. 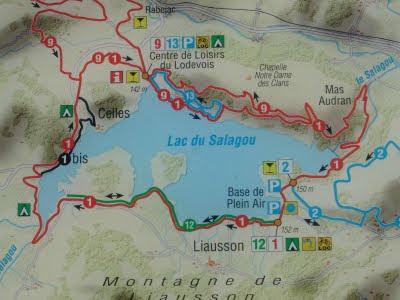 But I fear tomorrow more, two days after mountain-biking around the Lac du Salagou, all 27 km of it. My muscles will be giving me hell, I'm sure. Today I'm just wrecked with fatigue. You see on the picture there on the left? You see circuit number 1? That's the one. It's red, like for ski-ing so definitely a challenge, especially for rank amateurs like me. I went with my TWDB (his idea, actually...), and my youngest. My eldest had earned the right to do what he wanted in the afternoon thanks to a good attitude on Saturday so he opted to stay at home and see his pals. So it was that, in 14°C, we arrived at the lake, jumped on our bikes and headed clockwise from the Liausson Base de Plein Air. The track is actually pretty cool for about 15km, being mostly on the flat practically on the beach. It's a very popular spot with weekend mobile home owners/renters and there were lots of relaxed-looking folks sitting reading, eating, and getting water-sports material ready for use. We stopped a bit further on from the end of the green track 12 to have some lunch. No wine, natch, or we would never have been able to make it further. Nearby was an old truck that had been converted into what looked like a romany caravan with smoke issuing from the chimney. Another truck, a converted refrigeration one (with good insulation) had also been converted into living quarters and had its own electricity generator. Some people are really desperate for peace and quiet! Not that they were in the middle of nowhere by any means. The circuit is popular with cyclists and walkers and we saw several as we made our way round. I wouldn't want to be walking on the cycling track, however, with bikes coming hurtling round corners, down slopes and along the straight. Serious mountain-bikers have time limits they watch so woe betide the hapless old walker doddering along admiring the view, the peace and the path beheath their feet. The soil around the lake is dark red and in places people had taken white pebbles and spelled out romantic liaisons and other messages for all to see. Some were beautifully enshrined in a heart, others with less time/fewer pebbles/less conviction had kept it brief 'Gerard et Kiki' or just plain single 'Julie' who was perhaps waiting for her beau to add his name to hers. Further round, up some of the undulating weathered humps and bumps and down down down as I threw myself into the slope hoping that a) my bike would take the hammering, b) I wouldn't hit a rock, come flying off, crash land, split my head open, need emergency treatment, not get it and die in agony as my brain poured out onto the dark red rock. It did occur to me that I should perhaps be wearing a helmet if I was going to this sort of energetic biking. My TWDB suggested I only needed one if I had something to protect... cheeky sod. My youngest, who is a member of a mountain-biking club, was giving me advice on how to go downhill safely - to stand on the pedals, botty behind the saddle to shift the centre of gravity backwards. I would take off and he'd be yelling after me 'FESSES DERRIERE, MAMAN!' That did help concentrate my mind off crashing and ending up lying helpless in a pool of blood. Then there was quite a bit of climbing where you see circuit 13 joins 9, after which it's an easy ride along a country track looking down onto the lake some 200m below as far as Mas Audran. Fantastic views from above give a different perspective of the lake from the ones on the beaches. At Mas Audran, near Lacoste you go all the way down to the bottom of the valley weaving your way along the twisting lanes of the village built on a steep slope and arrive at the bottom of the dam. It's a daunting sight because you know that you have to climb up to the top along the road, and it's quite a haul. I had to get off and push because we were by this time quite a long way round and I was feeling super tired. I'd eaten my eldest's energy biscuit and had some chocolate too, but still my legs screamed out that enough was enough. We eventually made it, and then had another few kilometres gentle climbing until AT LAST the little yellow bike signs indicated us right, off the road and back to the car park. Relief. Parent Power with School Reviewer.